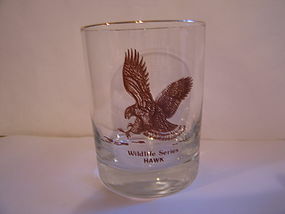 I do not know the manufacturer of this glass, but it is a nice quality with a heavy base. It holds 12 ounces and measures 4 1/4 inches in height. There is a gold trim on the rim. The graphics are brown. Very little, if any sign of use. The elk, as well as others of the series are available. I need your zip code to calculate the postage.